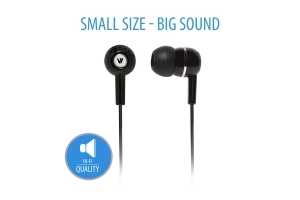 The V7 Noise Isolating Earbuds provide comfort and clear sound quality with every component. The V7 Earbuds incorporate a thicker quality cabling and heavy-duty flexible joints built to withstand rigorous daily use.They are ideal for use with all MP3, CD, DVD, MiniDisc players, portable game systems, iPads and iPhones and any electronic device that supports a 3.5mm audio jack. Smooth shapes and soft cushions ensure a perfect fit and seal inside your ear which provides sound isolation from exterior noises to enjoy music without missing a beat. Rich, Full-Range SoundExperience studio hi-fi sound quality in an in-ear headphone design, with soft bass and wide extensity. Smooth shapes and soft cushions ensure a perfect fit and seal inside your ear which provides sound isolation from exterior noises to enjoy music without missing a beat.Apple, iPad, iPhone, and MacBook are trademarks of Apple Inc. registered in the U.S. and other countries.